If you interested on the way back we will do a short drive through Honolulu historical down town or directly back to your hotel. Have your own chauffeur and a private vehicle and enjoy your time with your family and not be worry about anything as we will manage everything for you. Your private driver will pick you up and transfer to Pearl Harbor. You will be offered a bottled water or tropical juice before proceeding to the Visitors Center, where you will be given orientation and provided your pre arrange USS Arizona Memorial tickets including: Movie of the attack, museums of the attack and boat launch to the USS Arizona Memorial and back. Pearl Harbor is Hawaii’s most popular historic site. The USS Arizona Memorial, located at Pearl Harbor in Honolulu, Hawaii, marks the resting place of 1,102 of the 1,177 sailors and Marines killed on USS Arizona during the Japanese surprise attack on Pearl Harbor in 1941 and commemorates the events of that day. The memorial, built in 1962, is visited by more than two million people annually. Accessible only by boat, it straddles the sunken hull of the battleship without touching it. The sunken remains of the battleship were declared a National Historic Landmark on 5 May 1989. 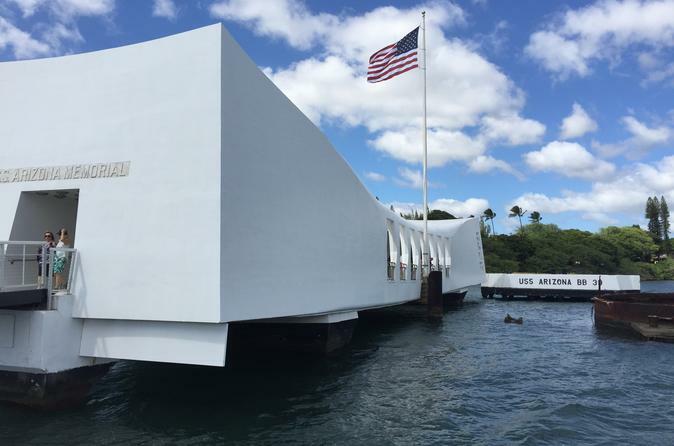 After the USS Arizona Memorial you will be taken on short downtown Honolulu City tour. For this private tour, we will be using an executive minivan clean nice fully insured. Professional chauffeur who dress nice will provide this service to you and pick up can be from any hotel in Waikiki.